I made “Tuskegee the Walrus” and then had to do “Sherwin the Alpaca” from Stacey Trock’s “Crocheted Softies” book. But I wanted to do him in cool colors rather than “normal” colors. So I had this variagated blue yarn and was about to run out as I was making him REALLY loopy and I shortened his neck, changed his muzzle and eyes and gave him a belly button. He turned out better than I was expecting once I changed him. Too much variagated was too much so I toned him down with some lt blue on his muzzle and made his eyes the TBC way. He just needs hugged, don’t you think? And then to top it all off Stacey wanted to use the picture of my Alpaca on her Ravelry page which is just so cool and flattering!!! Thanks Stacey. 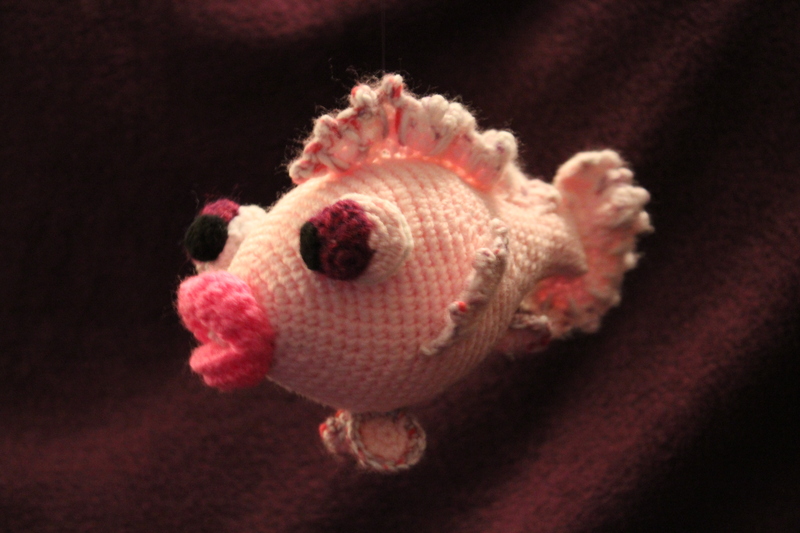 Here is my bubbles the little fish and she turned out pretty good. I started the twin to this fish today and should finish it tomorrow. The twins that I’m making this and a lavender one for are due in April. This was a great pattern by Delicious Crochet and I love her creations!!! My sister-in-law’s Mom, who throws pottery, made me this awesome bowl to hold the yarn balls so they don’t travel across the floor and into other rooms. It’s heavy enough that when you tug on the yarn it doesn’t go anywhere and is awesome!